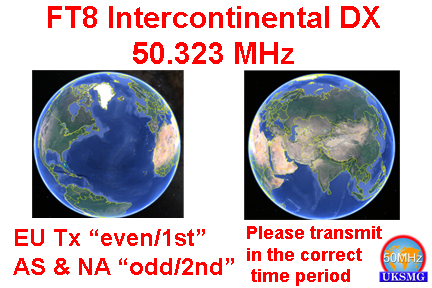 During the Northern Hemisphere Summer Es season the use of 50.313 MHz for FT8 contacts has become very congested, and stations are now using 50.323 MHz for Intercontinental DX working. In order to not cause QRM to each other and permit the most efficient use of FT8 for weak signal DX working, it is highly desirable for all stations to operate in the same transmit windows. The UKSMG has prepared these guidelines for the use of 50.323 MHz. European stations to transmit in the “even” periods. That is 00, and 30 seconds past each minute. Asian, and North American stations to transmit in the odd periods. That is 15, and 45 seconds past each minute. Do not use 50.323 MHz for working stations within your continent. Europeans working other Europeans are strongly discouraged. Please note that this code of practice is a work in progress, but the UKSMG feels it is important to publish at this time as we are approaching the peak Summer Es season in the Northern Hemisphere. Any comments or suggestions please email to g3zss@uksmg.org or use the comments form below.